As I stroll through the Native Flora Garden at Brooklyn Botanic Garden and marvel at the beautiful landscape, I sometimes think about the rich histories—cultural and botanical—that are layered underneath. A haven for native plant communities in the heart of a dense metropolis, the Native Flora Garden—which celebrated its centenary in 2011—was not long ago the site of an open grassland dotted with the livestock that supported the nearby communities and settlements. In precolonial times, the scene would have been much different. Few New Yorkers today can imagine what the metropolitan area looked like prior to European settlement. Mention the New Jersey Meadowlands, for instance, and most folks think mob hits, garbage dumps, industrial parks, and mile upon mile of invasive nonnative Phragmites grass. But the Meadowlands were once the site of an extensive Atlantic white cedar (Chamaecyparis thyoides) swamp, ringed by salt marshes and dotted with freshwater Sphagnum bogs containing sundews (Drosera species), pitcher plants (Sarracenia species), and fringed orchids (Platanthera species). Instead of freeways, housing, and airport runways, pitch pine (Pinus rigida) and oak (Quercus species) forests once surrounded Jamaica Bay, and where JFK International Airport sits, thousands of dragon’s-mouth orchids (Arethusa bulbosa) once grew. One of only a few naturally occurring prairie ecosystems on the east coast of the United States, the Hempstead Plains graced nearly 60,000 acres of what is now suburban Long Island. These are just some of the botanical treasures lost to development and urban expansion, much of it within the last 100 years or so. In the early 20th century, as advances in transportation and technology boosted urban development, most New Yorkers were oblivious to the environmental destruction going on within and at the fringes of their city. Terms like “habitat loss,” “species extinction,” and “conservation” were not part of the everyday lexicon. However, local botanists and plant lovers recognized the threats faced by native ﬂora. Stuart Gager and Norman Taylor, the ﬁrst director and curator of plants at BBG, respectively, were among them. Before Taylor joined BBG in 1910 (the year the Garden opened to the public), he had spent years in the ﬁeld as a research taxonomist, studying local native plants and classifying their relationships. His interest in local plant communities played an inﬂuential part in BBG’s prescient decision, in 1911, to open a garden dedicated to the display, study, and conservation of local New York ﬂora. 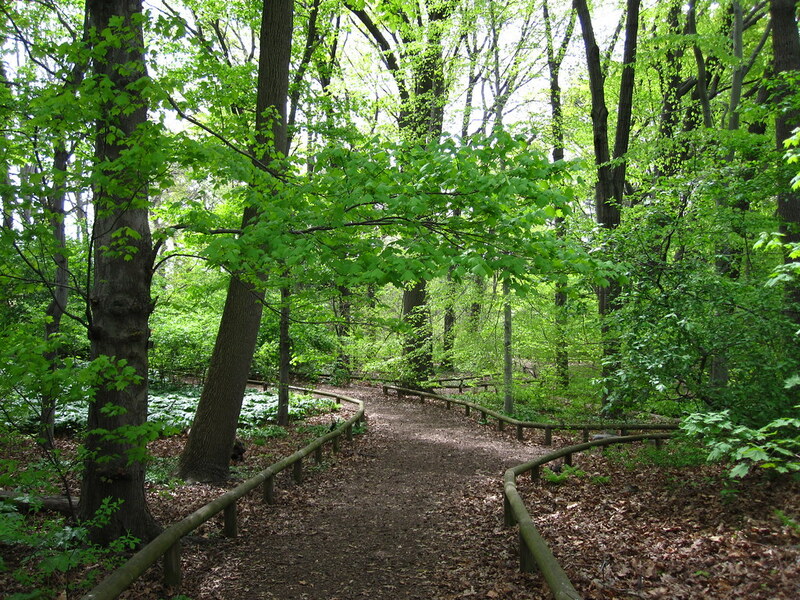 Situated in the northwestern corner of Brooklyn Botanic Garden, the Local Flora Section, as it was initially called, was ﬁrst planted as a wildﬂower garden and woodland. The design was twofold: Groves of trees and shrubs were installed in the north end with the express purpose of creating genuine woodland conditions through the gradual maturation of the woody plants; at the south end, wildﬂower beds were laid out in systematic fashion—that is, arranged according to plant family and evolutionary relationships. Herbaceous plants were displayed in beds so that Taylor could easily conduct classiﬁcation studies as well as research into ﬂower pollination and seed dispersal. Taylor’s research not only inﬂuenced the design but also the plant selection. Plants grown in the garden were from wild-collected sources rather than from nursery stock. This is standard operation in today’s conservation gardens, but in Taylor’s time, few natives were commercially available, so he had no choice but to collect species from the wild and propagate them for use in the garden. In any case, Taylor also recognized that wild-collected plants were better adapted for handling local environmental stresses than commercially produced material. The Garden Record also reveals that many other plants now considered regionally threatened or endangered were being grown in the Local Flora Section, including Corema conradii (Conrad’s crowberry), Helonias bullata (swamp-pink), Schizaea pusilla (curly grass fern), and several species of orchids. In the decade following the creation of the Local Flora Section, Taylor became more interested in plant ecology than systematics, focusing his research on plant communities and ecological relationships on Long Island. He once declared that ﬂoristic inventories were “as necessary and uninteresting as the telephone directory.” In 1929, plans were announced to redevelop the Local Flora Section, discontinuing the arrangement of herbaceous plants in beds and instead organizing the garden along ecological lines. One of the ﬁrst ecologically themed native plant gardens of its kind in the U.S., the revamped Local Flora Section highlighted nine plant communities found in the Northeast: serpentine rock, dry meadow, kettle pond, bog, pine barrens, wet meadow and stream, deciduous woodland, limestone ledge, and coniferous forest. Accuracy and authenticity of the display was a major concern for Svenson. He also felt it was important that the garden re-create the atmosphere of a true wilderness. Using wild-collected plants from each of the nine distinct habitats, he developed an exhibit that allowed visitors to have an accurate, immersive encounter with nature without having to leave the city. As the current curator of this garden, I am privileged to continue the efforts set in motion by Taylor, Svenson, and others. The Native Flora Garden, as it’s called today, has an almost magical authenticity as you stroll along its paths, due in large part to its age. The trees planted in the early days have matured into a collection of giants, some towering 100 feet or more over the forest ﬂoor. The leaves, seeds, and branches of these trees have contributed to nearly a century of soil formation, creating ideal conditions for shade-loving ferns and wildﬂowers. The garden continues to fulﬁll the three parallel roles intended by its founders and carried forward by subsequent gardeners and curators: display, education, and conservation. The Native Flora Garden is an example of a naturalistic, ecologically based exhibit that allows visitors the experience of a walk in the woods. It also continues to be an important resource for on-site conservation and research. Biodiversity is being lost from our wild areas at a frightening pace, and gardens like the Native Flora Garden provide a crucial resource for propagation, pollination, and dispersal research. Furthermore, the garden serves as a genetic repository and long-term seed bank for threatened species, ensuring their survival in cultivation at the very least. The Native Flora Garden enjoys a close relationship with the department of Science at BBG, which has been conducting a multiyear study of the ﬂora of New York City and its surrounding environment. Through repeated ﬁeld trips into the wild areas of the region, BBG botanists have located populations of threatened plants and collected their seeds, which in turn have been propagated and brought into cultivation in the Native Flora Garden. By growing these plants in a garden setting, we can show the public what is being lost and why. We are also using and preserving local genotypes, an important practice not just with endangered plants but with all new introductions into the garden. Locally collected seed-grown natives are adapted to our growing conditions and contain broad genetic diversity, which increases their chances of coping with future challenges, such as climate change. The last, and perhaps most important, function of the Native Flora Garden is to continue exposing generations of children and adults to the diversity and splendor of New York’s native plant communities. In our increasingly urbanized world, people have fewer and fewer chances to encounter authentic wildness and nature; in New York City, BBG’s native garden is helping many folks, especially kids, make that important connection. As the Native Flora Garden heads into its second century, a major challenge looms large: The tree canopy has matured, shading out sun-loving plant communities like the pine barrens, the serpentine barrens, and meadows. We simply don’t have the cultural conditions to display these plants well. An expansion project, scheduled to open in 2013, will allow us to breathe new life into the declining exhibits and improve the educational experience for our visitors. Roughly one acre will be dedicated to meadow habitat, using a plant palette derived from the remnant grasslands of Hempstead Plains, on Long Island, and the serpentine barrens of Staten Island. The remaining acre will be used to display pine barrens habitat. A pond and surrounding shore area will feature typical lowland and wetland pine barrens vegetation, while dry sandy areas surrounding the pond will become home to upland plant communities dominated by pitch pine and various oaks. The plant material for this new garden will come entirely from locally collected seeds of wild plants. The Native Flora Garden has much to teach about plant communities and the environment; the interactions between plants, insects and wildlife; the importance of native plants as they relate to our natural, cultural, and economic heritage; and the vital importance of conservation efforts that support biodiversity. The future of the garden is bright and full of hope. It has been an inspiration for our visitors over the last century and will continue to shine well into the next. Uli Lorimer is curator of BBG's Native Flora Garden. He has had a lifelong interest in native plants and collaborates with regional botanists and horticulturalists to promote the use of native plants in the landscape. What wonderful things have been created there! So many places did not have such forethought and much has been lost. I spent a year in NYC and didn’t know what was there. Of course I was young and had not developed an interest in gardening let alone natives. Your article makes me want to come back just to experience what New York was like before settlement! I have been sketching as many wildflowers, as I could find in Long Island City this spring and collecting seeds as well. The pyxie-moss grows in many areas in small patches between cracks in sidewalks and so on. I am still searching and delighted to find so much to document as the summer flowers begin to replace early bloom. As L.I.C. loses its wild patches with all the new developments, I wish I knew what to do to promote wildflowers beyond documenting them here. I hope that you can advise me with your expertise. BBG's Native Flora Garden. Photo by Rebecca Bullene.